I had early morning meetings the last two days so I haven’t had time to post. I haven’t had much to post for that matter so I’m glad today, I have my normal routine back. Yesterday I was fortunate enough to play Eagle Ridge. 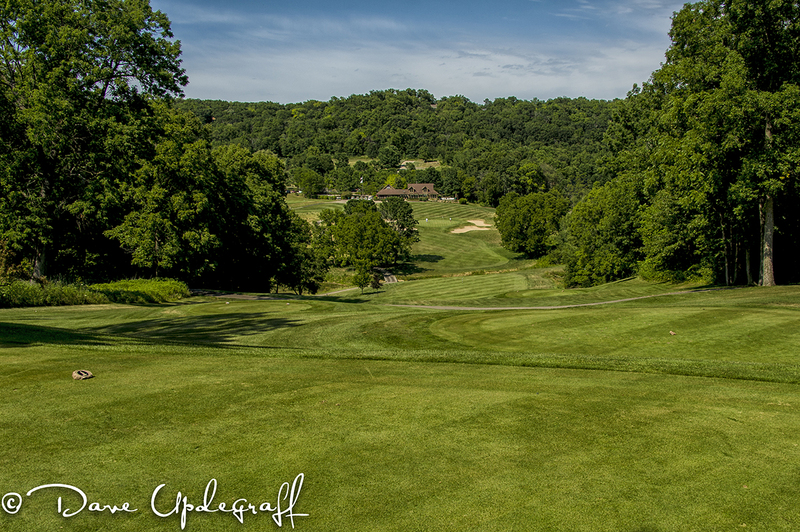 There was a “correspondent” bank outing, hosted by a Dubuque bank and we played Eagle Ridge South course. The clubs are back in the basement and I have a feeling they may stay there the rest of this year. I had a good time yesterday but I would have had a better time just riding around in a golf cart taking pictures of the course and the golfers. 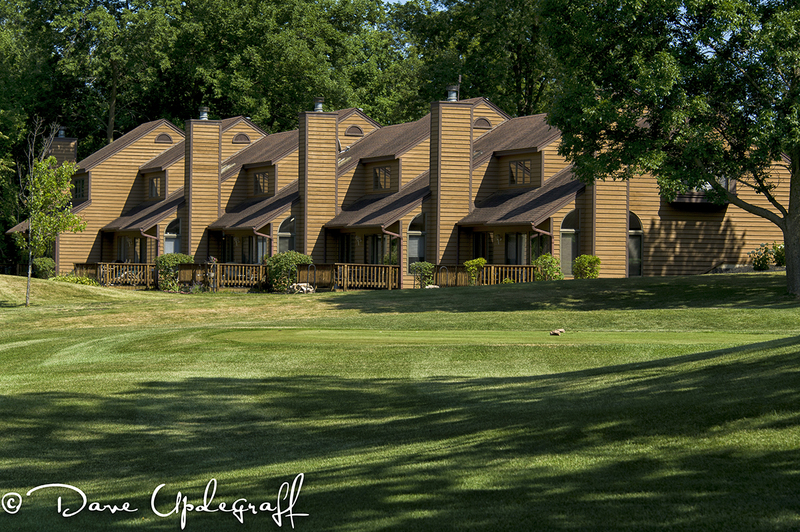 The above image is of the 18th hole. There is a small stream that divides the hole in half with an elevated tee and green. Not a very long hole but it takes two exceptional shots to be on the green in regulation. I was not on in regulation. That’s it for today. Thanks for stopping by. Enjoy your mid-week day. it’s going to be a hot one. Pray for rain. Please be careful. A very enjoyable evening last night. 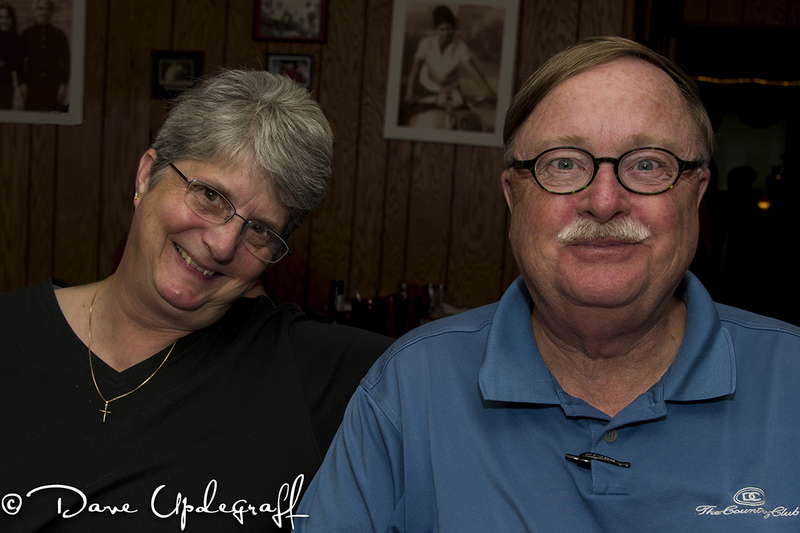 Our good friends Steve and Becki Kent came up from DeWitt and spent the evening with us. We stopped at the Star Brewery for some wine and conversation and then went to my favorite restaurant in Dubuque, Mario’s Italian Restaurant. I love going out to dinner with good friends. I enjoy the ambiance of a nice restaurant, the good food, drink, and of course the great conversation. Steve and Becki are wonderful friends and we really enjoy their company. That’s all for today. Enjoy your Sunday and be careful. Happy Saturday. Hope you had a great week. Yesterday I accomplished something I have wanted to do for several years. There has always been a reason (no matter how feeble) why I couldn’t do it before now and yesterday turned out to be the day there were no excuses. 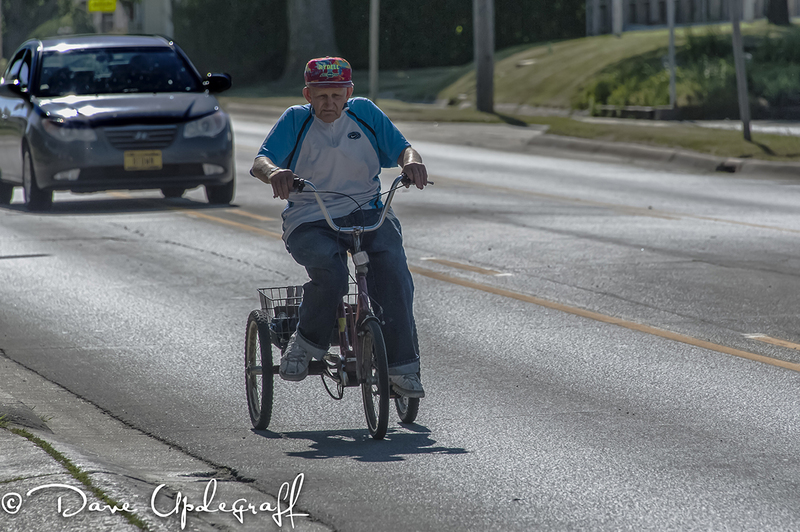 A few years ago I was going to lunch with some co-workers (I was a passenger) and we went by this old guy on a three-wheel cycle. 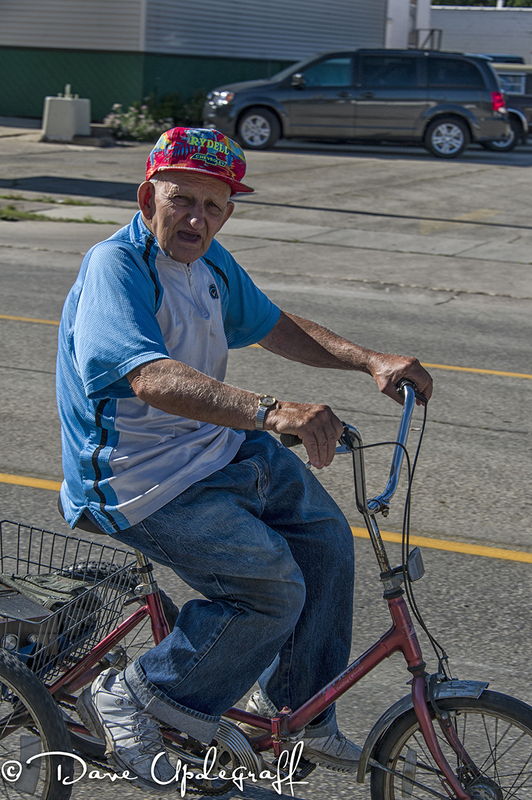 He was riding on the side of the road and in the brief glimpse I got of him he seemed to be an older gentleman. 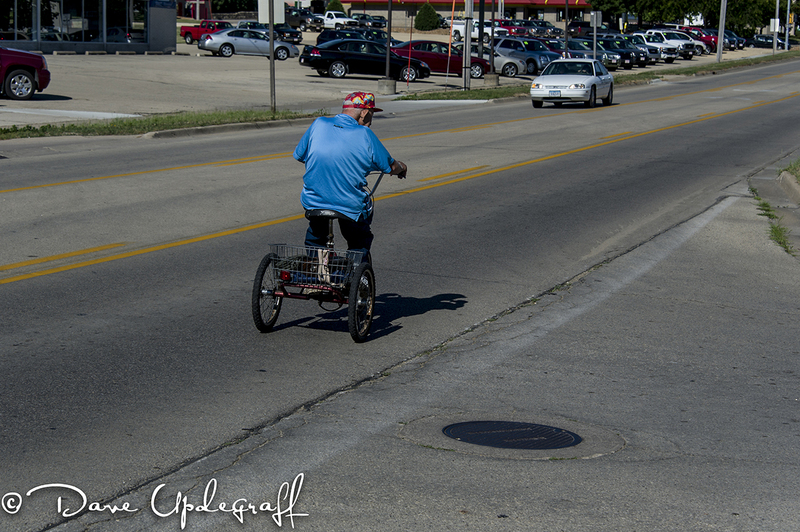 Over a period of time I would see him occasionally all over town on his tricycle. Moving ever so slowly but making stead progress nonetheless. I became more intrigued by him. It really didn’t seem to matter what the weather was. He would be out on his three wheel conveyance always moving at a slow and steady pace. Then one really cold wintry day I was again a passenger in a friend’s car and we were going to lunch. I remember very clearly how we had talked about maybe it would be better to just go across the street to the hotel as the roads were so bad. It was bitterly cold (I’m not sure of the temperature) the wind was blowing and it was snowing. When we got out of the car the snow was painful hitting my face so you kind of get the picture, nasty day. On the way back to work traffic was moving very slowly because of the street conditions and we went past this old gentleman on his tricycle going somewhere. I looked closely at him and there was water frozen on the end of his nose and around his eyes but he was still peddling and making progress. I said to myself I have to find out more about this guy. I asked the friends in the car and no one seemed to know much about him or what his name was. I have seen him a lot over the years. But every time I have seen him something prevented me from getting a picture or stopping to talk with him. I remember a few weeks ago I went past him and as usual I was late for some meeting or needed to get back to work. I thought well I’ll just take the time and I went around the block and then I couldn’t find him. The next time I wouldn’t have my camera, or the people with me didn’t want to take the time. There was always a reason. Yesterday I had a breakfast meeting at a local restaurant on the West side of town and when finished I was on my way back to the office. I saw him coming and I went past him, then I said “Today is the day!” I turned around drove past him so I didn’t lose sight of him again got a couple of blocks down the road and waited for him. I was shooting into the sun so I didn’t get a good picture at first but I kept shooting as he went by me. He said something to me (I couldn’t make it out) but I could tell he wasn’t very happy about me taking his picture. I said “Hi” when he went by and he grunted at me. I got back in the car sort of proud that I had finally got a shot of him and headed back to the office. But I didn’t feel good about what had just happened. I couldn’t leave it like that, so I did a U-turn and got ahead of him again and pulled off the side of the road, parked, and waited for him to come by. We had a good talk although I didn’t understand a lot of what he said. He always talks with his head down and he doesn’t have any teeth so with my impaired hearing I just got bits and pieces of his conversation. His name is Seward Clampet and he lives in Maquoketa. He is 78 years old and lives on Arcade Street at the top of a pretty steep hill. He usually has to get off his tricycle and push it up the hill but he rides it as far as he can. We talked for about 10 minutes and he felt good about the conversation and said it was okay that I took his picture. I felt good because I had finally connected with this remarkable man and learned a little about him. I will have more encounters with him as time goes by. I want to learn more about him. Thanks for stopping by. I didn’t mean to get so windy but this was a story I was excited to tell. Enjoy your weekend and be careful. Happy Friday. Today I will once again opine about the evil power line. 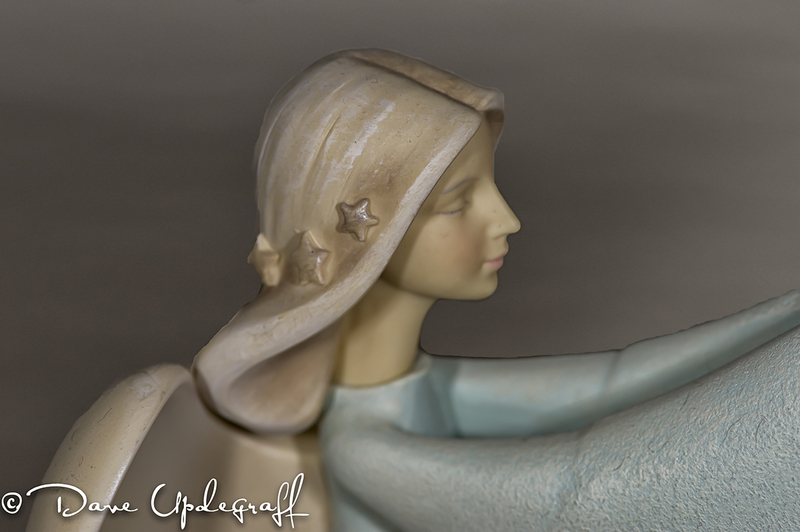 🙂 Additionally I’ll talk a little about Photoshop and the wonderful opportunities it gives a digital photographer to enhance, rescue, and restore an otherwise less than desirable image. Of course Photoshop has a lot more uses than that but that is my focus today. The train above is nothing special. 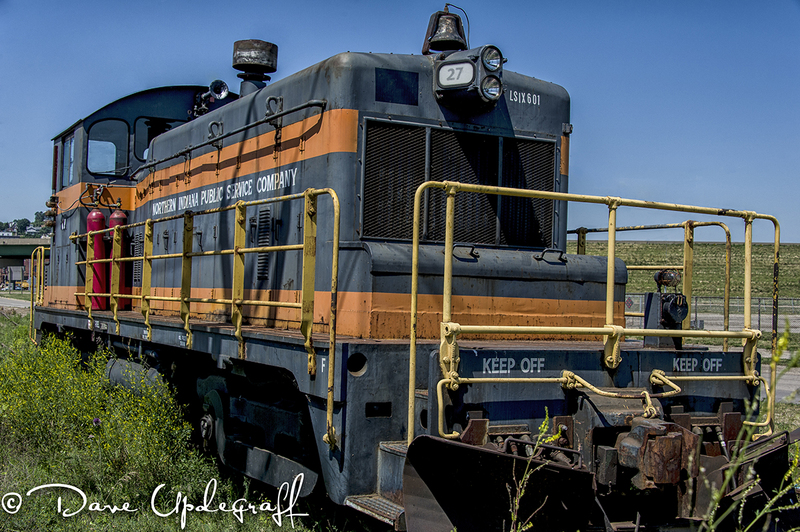 It is an old, abandoned diesel locomotive sitting on a section of track that is also abandoned. When I drove by it I thought it would make a great black & white image, perhaps in a retro finish. I was aware of some power lines in some of my shots but I thought the composition of some of my shots would yield an image that would only take a few minutes with the healing brush to make pristine. Boy was I wrong. I also shot some close-ups of the headlight and other salient parts of the train that in my mind’s eye would make a nice train story. 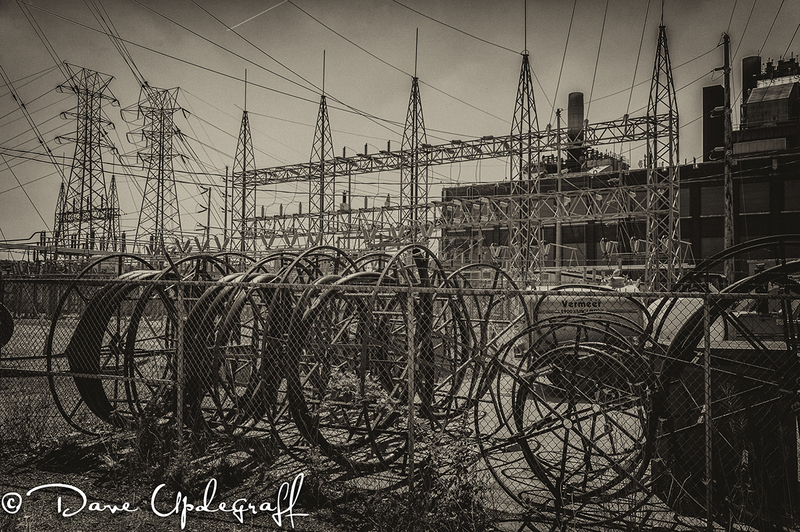 When I opened this image in Lightroom I was surprised by all the clutter and power lines that showed up in the image. So I decided to see if I could fix it. Why, you might ask. It’s not that great of a shot to begin with (or for that matter to end with.) That is correct but I really enjoy working on images. I enjoy working on them almost as much as creating them in the first place. Anyway, to end this ongoing dribble, it took me over an hour to remove the power lines and then I noticed (I’m a little slow) the big steel road sign right in the middle and I figured as long as I spent all that time removing the power lines I might as well get rid of the sign too. Add another 30 minutes. Thanks for stopping by. Enjoy your Friday, there are only 52 of them this year and they are all precious. Be careful. What a week so far and it is just the start of Thursday. 🙂 I was fooling around with the macro lens last night, taking some images of things I normally would not even think about shooting. 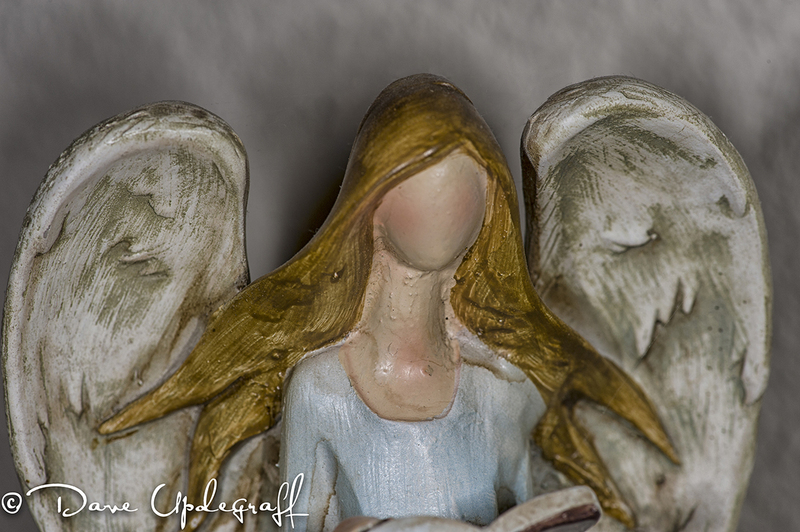 We have some angels sitting on the piano in our living room and this one caught my eye. When I uploaded the images to my laptop I was intrigued by this image. There is something about it that I like and I’m not sure what it is. I’m trying to set up some studio portrait shooting in the next couple of weeks. I’ve taken some more lessons on lighting and I want to put what I think I have learned into practice. I’m on the board of the Maquoketa Chamber Of Commerce and the official pictures of the board have been cropped out of images taken at various Chamber sponsored events. They look really bad. Tanks for stopping by. Enjoy your Thursday and be careful. Good Day. 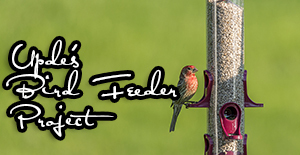 A short post today as I had a late night. In my role of President of the Chamber of Commerce I had to meet with the City Council last night. It was not a pleasant experience and reminds me of just how much disdain I have for politics. Which brings me to another subject that I have disdain for. Power lines. They are the bane of photographers everywhere. I can’t imagine how much time and effort is spent cropping them out of an image or using the clone tool or the healing brush to remove them from a scene or how many shots that are simply not taken because of power lines. We have become so accustomed that our subconscious mind actually filters them out of our vision. I have taken many images only to be later frustrated by the number of power lines in the image. I remember watching a video lesson from Scott Kelby some time ago and he was talking about the time that he took this beautiful landscape image. In fact he even called a friend of his while there to tell him about the area. He said he was just flabbergasted when, in post processing, he noticed a number of power lines running through his image that he had not seen when taking the shot. It is also called cognitive blindness. Happy Monday. It was a wonderful Father’s Day for me yesterday. My kids took me to breakfast. We were joined by Jeanne, Josh and Ben. We ate at the Village Inn. I’m sure there were people eating at other restaurants in town but it would have been hard to think that being at the Inn. We had to wait about 25 minutes. 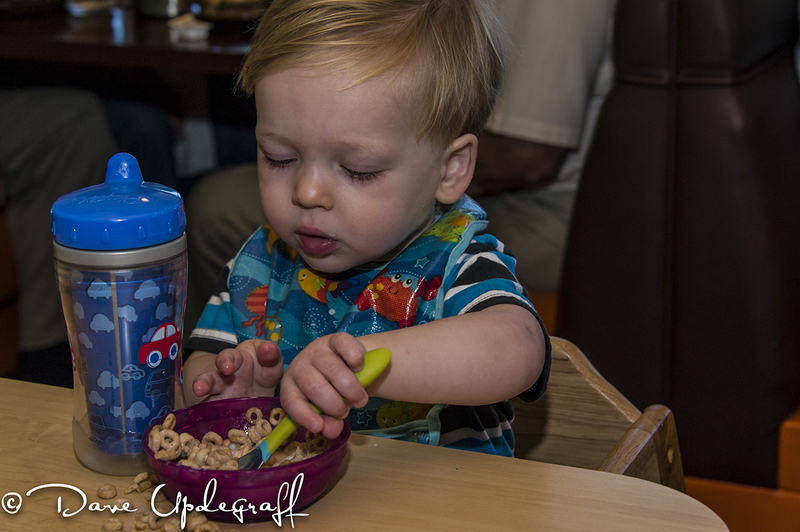 The service was great and we got our food fairly quickly considering how busy they were. When we finished there were as many people or more waiting for a table as when we came. No question VI is a great place to eat. Angie, Ben, and Joshua all have colds and congestion. 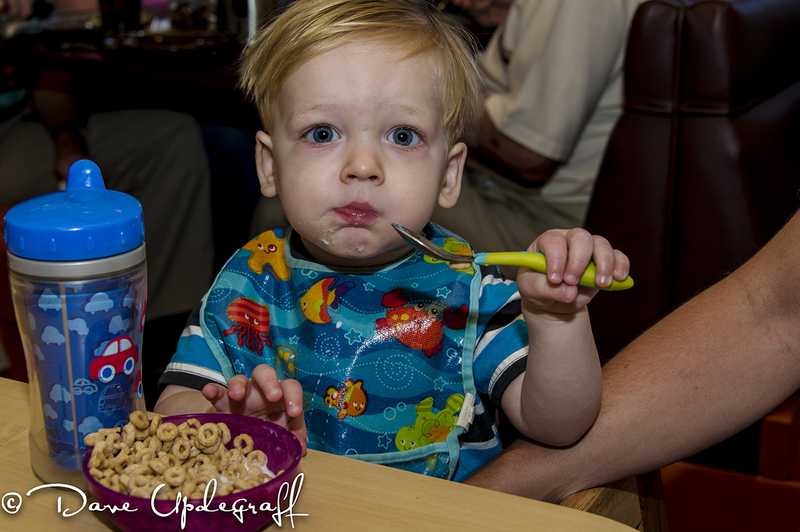 As you can see from these images Josh is learning to master eating utensils. 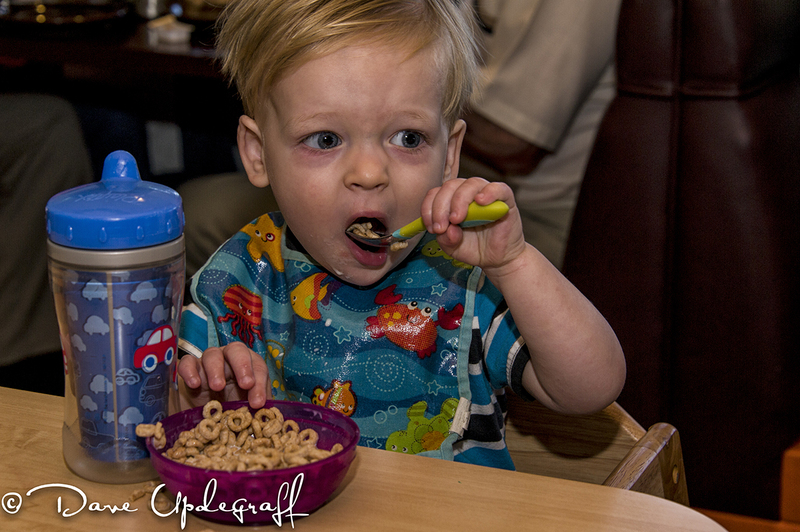 Roughly two-thirds of the Cheerios on the spoon would end up on the floor on in his lap. But the more he tried the better he got. I enjoyed watching him. After breakfast and receiving some wonderful cards from my children we went home and I did one of my favorite activities. I took a nap. 🙂 The rest of the day was spent watching the US Open. Excellent Father’s Day. I hope yours was as well. Enjoy your Monday and the week ahead. 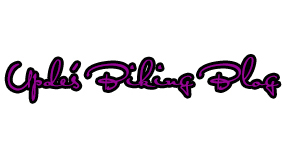 Thank you for checking out my blog. Be careful.